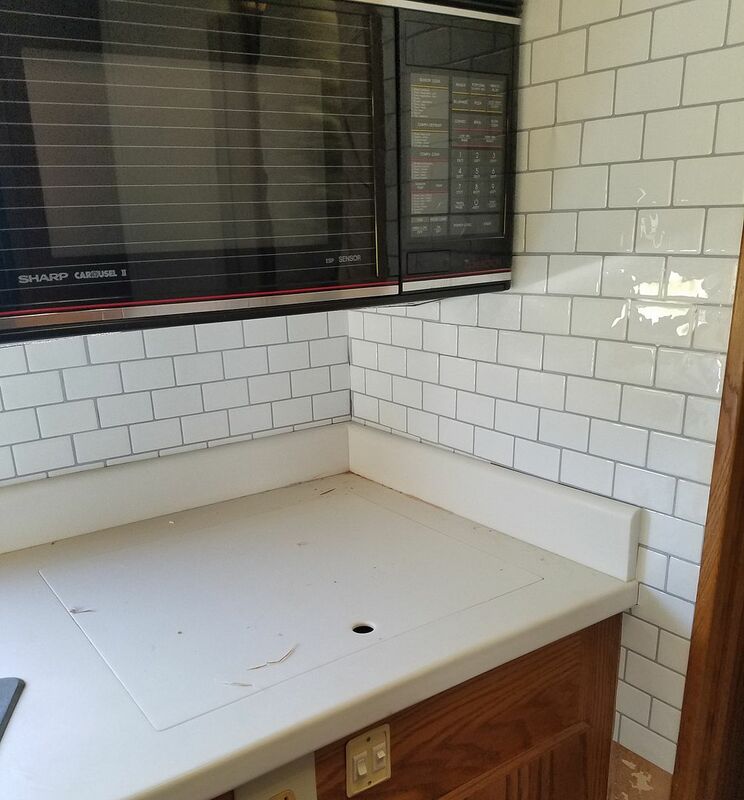 The original oddly placed mirror above the kitchen counters was in fairly bad shape on the 93 Breakaway that we recently purchased so I decided to pull it and install a subway tile back splash instead. It is not yet complete as the picture below will show. Thoughts? I had to take down the shades around the small window in the kitchen and the change in available light was pretty shocking with it down. I may decide on a different solution than putting it back up. I am wide open to suggestions. Original post has locked me out so here is an image of the backsplash as it stands right now. I will send a final picture when it is complete. Looking good! When I did the metallic tile backsplash I removed the curtain rod holders, and Suzie applied a static cling crushed ice to the 2 small panes. It lets in plenty of light but obscures the glass so you can't see in. [or out]. You can see it in the last pic in my kitchen remodel post in Pix of my Barth. Please contact Kevin to use Photobucket for the image. Spca here is limited. BTW, your current image is so large it's unusable. I'll leave it up a couple more days so you;ll have time to use PB. Scot, please refer to the photo Posting Procedure in pictures of my Barth. If the link here is not working it is also listed in the community announcements page. Your folder is 3810. I reported this number to you in a text. It is the sequential build number of the Barth you now own.